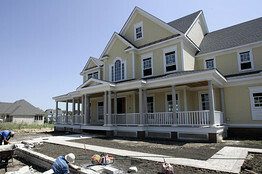 Builders Have Little Incentive to Create More McMansions and Hardly Anyone is Buying. There are Deals Out There, But You Better Act Fast. If you're looking to buy a brand-new McMansion in the 'burbs, you'd better act fast. With home prices this low there's not much incentive for builders to start new houses. And inventories are getting razor-thin: Economists and analysts at the National Association of Home Builders fall construction conference in Washington, D.C. on Wednesday pointed out that the current 7.3-month supply of new homes is the lowest it's been since 1992. Moreover, most of the summer's pickup in home sales and starts, which has since abated, could be attributed to the $8,000 first-time home buyer's tax credit. With that credit slated to end on Nov. 30—and with continuing problems securing money to build—builders have little incentive to ramp up their production of new homes. Many places will take years to rebound. Rockville, Md. builder Robert Mitchell says these days he'll only build a home when he has contract in hand, because his lenders won't advance money for speculative building. "We sold off our standing inventory," he says. Before the drought: Construction workers build a new home in August 2006 at a new sub-division in Sugar Grove, Ill., a suburb outside of Chicago. Normally, short supply means higher prices. But consumers have been so battered by job losses and falling home equity, many are unwilling to commit to buying. Mark Zandi, chief economist of Moody's Economy.com, notes that "homes are as affordable as they've ever been," based on household income. However, he says that continuing layoffs and foreclosures will continue to depress prices, which have fallen 32% since their 2006 peak, according to S&P/Case-Shiller's composite 10-city index. He predicts that prices will fall another 5% to 10% before stabilizing in the middle of next year. When the market does start to pick up, the NAHB sees that happening two years from now, the landscape will be changed, literally. After a long run-up in median new home size, peaking at 2,309 square feet in 2007,home sizes shrank to 2,091 square feet in 2009. "It's the largest decline ever seen," said NAHB's chief economist David Crowe. Since first-time buyers and their parents, the empty-nesters, will be the dominant demographic groups over the next decade, builders will cater to those groups more modest needs. Already, big builders like Toll Brothers have introduced models that look more like cozy carriage homes and four-squares than their usual English manor-style homes. In the meantime, the next couple of years are going to be strange for those who want to buy new and have the means to do it. Sure, interest rates are likely to remain favorable (in the 5% to 6% range, according to Mortgage Bankers Association chief economist Jay Brinkmann). But you may have to settle for an already-built home in a builder's inventory if you want a bargain. Demand is so weak and prices so low, that for many builders, creating a new home to your specifications just isn't worth the effort. The NAHB's Mr. Crowe noted that 56% of builders the trade group surveyed recently reported that appraisals for their homes fell below the cost of building.